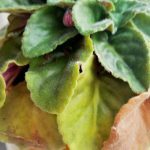 I'm following all light, water and temperature requirements for growing African Violets indoors, but my A. Vs never thrive. They gradually turn limp and rot away. I'm desperate to know what I'm doing wrong. Please help. The only answers I have is that they are too wet or too dry. But you are following directions. Did you use African Violet potting soil? If all of this is followed, I don't have a clue. I would take a plant with you to a store where they sell them and ask what they think. If a box store, ask for the plant expert.